It takes only eight minutes to see the results. Medical diagnosis is a field that doesn’t want to be left behind as more technology takes over health care — and rightly so. Arriving at a correct diagnosis faster can spell the difference between a life lost and a life saved. To wit, a novel method has just been approved by the U.S Food and Drug Administration (FDA) that allows faster allergy diagnosis using just a single drop of blood. The test was developed five years ago by the Swiss Federal Institute of Technology in Lausanne (EPFL). An EPFL spin-off called Abionic, which took over the development of this method in 2010, created the abioSCOPE platform. This test requires single-use capsules, fed to a portable testing device currently capable of detecting four common allergies: dogs, cats, and pollens from common grasses and trees. The blood, combined with a chemical reagent, is fed to the testing device on a DVD-like mounting plate. That combination forms specific molecular complexes as the sample interacts with biosensors from the capsule. The complexes are then optically detected using an integrated laser. The initial results appear on a high-resolution touch screen in just five minutes, with the full results saved on an Abionic-provided SD card. The prevalence of allergies, from simple irritations to more fatal attacks, have not diminished despite improvements in today’s medical technologies. Recent statistics compiled by the American Academy of Allergy Asthma and Immunology (AAAAI) show that general allergic diseases have been rising for the past 50 years, and incidence among school children have increased to 40 to 50 percent. The Asthma and Allergy Foundation of America, meanwhile, notes that allergies are the sixth leading cause of chronic illness in the U.S.—be it nasal or food allergies. Faster allergy diagnosis could make it easier and cheaper to treat this condition, and even save lives by preventing someone from discovering an allergen by way of anaphylaxis. “There are 25 million adults in the US who suffer from allergic rhinitis, a number that is constantly increasing,” Nicolas Durand, CEO of Abionic, said in an EPFL press release. 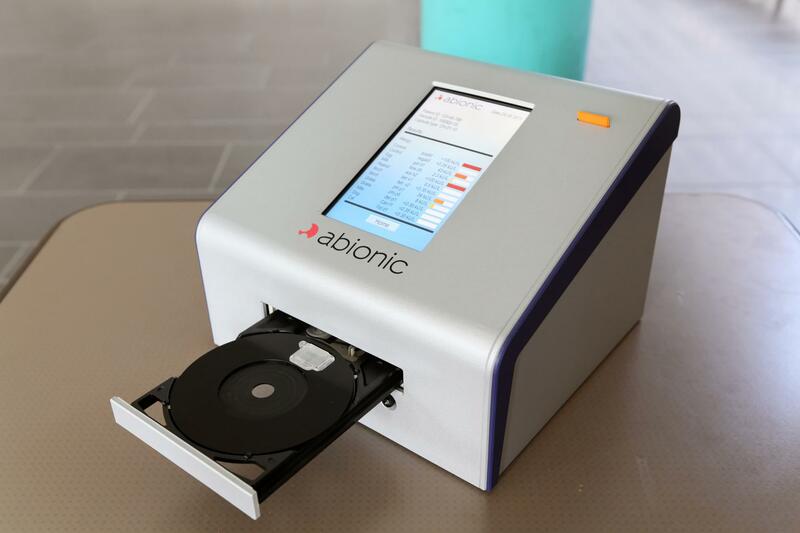 With the abioSCOPE, which Abionic describes the abioSCOPE as the “world’s most rapid” allergy test, it’s now possible to detect at least four of the most common allergies without the usual uncomfortable and invasive methods. Plus, it’s relatively simple to administer, and the results become available in just 8 minutes. This method joins a growing group of rapid, minimally invasive tests for complex and deadly illnesses. In cancer research, the latest diagnostic techniques are in the field of liquid biopsy, particularly with the use of blood tests to uncover signs of tumor growth. A similar technology has been developed for detecting heart attacks. Abiotic’s itself also offers rapid tests for iron deficiency and sepsis (a serious wound infection) using its abioSCOPE platform, and is developing a system to detect asthma. Already certified for use in Europe, the abioSCOPE allergy test is expected to enter the U.S. market in 2018.